"Even if you caught a fishing boat, with what you know you're dead." The 1996 release Alaska is kind of like a family-friendly blend of Vertical Limit and Cliffhanger, with a heady mix of any number of those magnificent vista-filled outdoor adventures that feature cute animals and dangerous encounters with Mother Nature. Director Fraser C. Heston (son of Chuck) turns our northern-most state into an artificially serene Sierra Club postcard, and plops a couple of unlikely rescuers, in the form of 14 year-old Jessie (Thora Birch) and 16 year-old Sean (Vincent Kartheiser), right in the middle of it. After their bush pilot dad (Dirk Benedict) crashes during a storm near desolate Devil's Thumb, Jessie and Sean set out on a long, rugged journey across harsh wilderness to find him. The sheer preposterousness of this premise notwithstanding, Alaska is a stunning travelogue, aided by one of those purely casual acting jobs that a young Birch was able to seemingly deliver with her eyes closed, well before her abysmally laughable turn in Dungeons & Dragons. The pair of intrepid rescuers are eventually joined by an orphaned polar bear cub, and after some Native American foreshadowing mumbo jumbo about spirit guides, it becomes pretty clear that this bear is likely much more than just a wild animal. Jessie and Sean's travels are hindered by nasty poacher and big-game hunter Colin Perry (NRA honcho Chuck "Moses" Heston) and his doofus guide Koontz (Duncan Fraser), who want to not only capture the polar bear cub, but inexplicably strand the two youngsters alone in the wilderness. Needless to say, there is plenty of hiking, climbing, more hiking, white-water rafting, more hiking and yet more climbing, as Jessie and Sean make their way to the dreaded Devil's Thumb. The appeal of a film like this is the simple majesty of the on-location footage, and except for just a couple of hokey process shots, Alaska looks as naturally rugged as it is supposed to be in the story. There are plenty of swirling overhead camera shots as Jessie and Sean make their way across the wild terrain, and D.P. Tony Westman (who worked with director Heston on Needful Things) has captured some amazing visuals that had me occasionally forgetting the sporadic thinness of the plot's believability factor. As a film suitable for the whole family, I have to admit that I really enjoyed Alaska, and it's a shame that Warner Brothers didn't see fit to release this in anamorphic widescreen. I prefer widescreen, naturally, but I don't necessarily feel that all "family" films suffer from full-frame treatment. Something like this, however, with it's broad expanse of wilderness, made me suspect I might have been getting short-changed on the scenery. Image Transfer Review: It's a shame a film like Alaska was issued in 1.33:1 full-frame aspect ratio, because D.P. Tony Westman's cinematography is at times truly breathtaking, and though the film never came across as looking particularly cramped, I just know that there were some beautiful vistas being mercilessly chopped in order to fill the screen. Colors are bright and naturally vivid, and the film's multitude of wilderness location shots look great. Image detail is excellent, and black levels are solid. Where's the OAR widescreen, Warner Bros? Audio Transfer Review: Alaska comes with a pleasant 2.0 surround track that is deceptively full-bodied, and one that offers enough subtle rear channel cues (helicopters, rushing water) to give the presentation a fair amount of depth. More importantly, the Reg Powell score, with its punchy theatrical dramatics, sounds outstanding. Dialogue, sparse as it is, is well-mixed and clear. Extras Review: Not much of merit in the supplementals, other than a typically puffy Behind-the-Scenes (10m:15s) piece that features practically all of the key moments in the film (in a horribly dark print) amidst brief sound bites from Birch, Kartheiser and both Hestons. There's some extra footage of the cute baby polar bear that elicited the proper "oohs" and "aahs" from my daughter Sammy. Rescue!, a so-called interactive adventure, mixes clips from the film with random Alaskan wilderness factoids. The disc is cut into 27 chapters, and includes subtitles in English, French, Spanish, and Portuguese (though the case says there should also be Chinese, Bahasa and Thai, which just aren't here). 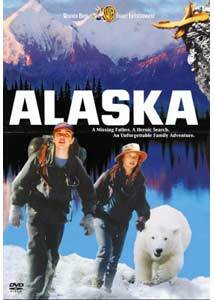 Fraser C. Heston's Alaska is an extremely well-made family adventure, complete with a cute polar bear, a treacherous poacher played by Charlton Heston and another effortless performance from a young Thora Birch. I can forgive some of the film's overly simplistic maneuvers (like the far-too-human antics of the polar bear cub) for it's balance of beautifully shot on-location nature footage and perilous adventure. Alaska is ideal for a family night rental. Recommended.